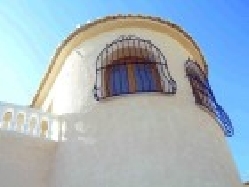 VILLAS AND APARTMENTS TO RENT IN DENIA, SPAIN. 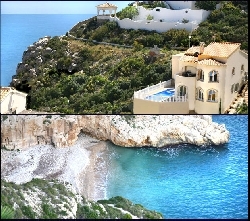 Welcome to our selection of holiday homes to rent in Denia, Spain. The popular Costa Blanca resort of Denia is located on the tip of a headland, making it less sheltered than some of the other towns on this stretch of coastline. This brings its advantages too, as the town is home to one of the largest fortresses in this part of the country, built on this site because of the view from the headland. Denia is also home to one of the major ports of the area, where the daily ferry to Ibiza departs, as well as many pleasure boat cruises that head down the coast to Javea and Calpe. As with many Costa Blanca resorts, most tourists are attracted to the town by its beaches. There are two main beaches in Denia, separated by the large port, and both are very popular in the summer months. The beach to the north of the harbour, Les Marines, is the most popular with visitors and has a long stretch of sand with regular toilets, showers and lifeguard stations. You can hire a pedalo or enjoy a snack and drink in one of the promenade bars. South of the port is the quieter beach of Les Rotes. This stretch of coastline is rockier, meaning that the beaches here are small, sheltered coves. Some can be difficult to get to, but once you've made it down you will be rewarded with a peaceful, almost private, beach and stunning clear water for swimming. Further south is the open beach area of Les Deveses. This area is often too windy for sunbathing, but conditions are perfect for sailing or windsurfing. Around the port of Denia, there are many street cafes and restauarants where you can enjoy fish that was freshly brought into the harbour that morning. Boat trips are also popular along this picturesque stretch of coast, and you can enjoy non-stop cruises, get off in one of the neighbouring towns or even a round trip in a glass bottomed boat! Walk a few streets further back from the harbour and you will come to the older part of Denia and the fortress. There are quite a lot of steps to climb up to the main castle buidling, but you are rewarded with a fine view over the town once you get to the top. The fortress is now home to a museum on the history of the 11th century building and the town itself. 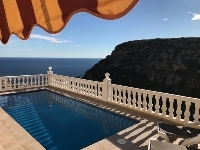 Looking for self catering holiday accommodation in Denia? Then below is a selection of apartments in Denia and villas in Denia that can be rented direct from their owners. You can either click on each listing for further details or you can use our search engine on the left if you are looking for something in particular.